This past week I had a theme going at the flea market...it was almost all of the white and red variety. I'm okay with this though since it's all just pretty adorable. Pretty darn cute huh? And the best part...all these goodies cost only $10. 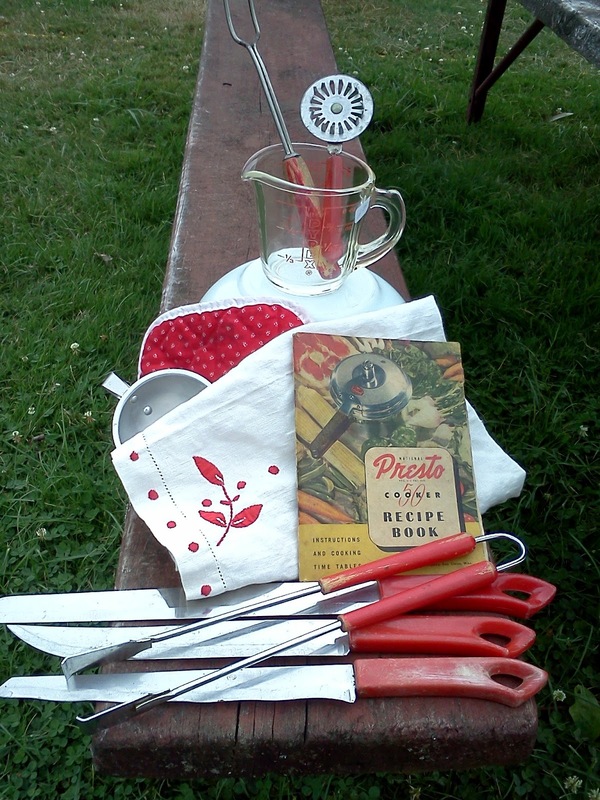 The red handled knives, tongs, etc were all only fifty cents each. I was especially excited about the tongs. The Presto recipe booklet was also only 50 cents and from the 1940's. The metal thingy is a scooper that is similar to the one my dad got me for my birthday. I thought the towel was really cute with the red design. The simple red pot holder was only a quarter. Finally - the Pyrex. The measuring cup was only a dollar and the Opal mixing bowl was $3. I was pretty excited to find the mixing bowl as it is my first piece of Opal. That tis all for now! Hoosier update should be coming soon since I got some good progress in on it today. It's finally coming together - literally!